Twins Dwight and Dwayne Bosman have been delighting jazz audiences in and around St. Louis, Missouri (and indeed, all over the world) for almost fifty years. Their father, the late Lloyd Smith, was a multi-instrumentalist before the word was invented. The boys learned their love of music from Smith, and when they were 10 years old Dwayne began playing flute while brother Dwight started on the clarinet. Eventually, both boys turned to the sax, with Dwayne going for the tenor and Dwight the alto. Each brother is also proficient in several woodwind instruments. After all their years of performing live, the Bosman Twins are now working on an album that will be released in the Spring of 2015. A few years ago, they recorded another album consisting entirely of standards. The title, fittingly enough, is “The Bosman Twins Play Standards”, and that is the one I want to tell you about this week. “Standards” was apparently recorded as an experiment, and although it is available for sale on the brothers’ web site (link below) it wasn’t originally intended for public release. I have to say that despite a few technical shortcomings, musically the experiment was a rousing success. The album opens with the John Coltrane hit, “Moment’s Notice”. This is probably one of Coltrane’s more popular songs, and the brothers’ treatment of it here can only further the Coltrane legacy. Both brothers jump right in at the beginning, and even though guitarist Moore gets in a short lick, this is their show until the rhythm section joins in. Bassist Moore lays down a hard bop line while drummer Carnes keeps it moving forward. Next we have the classic “Black Orpheus”, written by Brazilian composer Luiz Bonfa for the movie of the same name. Pianist Taylor takes the head and then makes way for one of the horns, possibly alto sax. This song has a nice Latin touch for those who like that sort of thing (I do, in moderation) and the guys do an excellent job of it. A bit over three minutes in, guitarist Moore takes the lead for a moment before one of the saxes returns and takes it to the finish. After “Black Orpheus”, we are treated to one of the most famous songs in all of jazz, Erroll Garner’s “Misty”. This mellow masterpiece has been thrilling jazz audiences worldwide for over 40 years, and the brothers’ treatment of it is superb. Brother Dwayne and his tenor sax runs this one nicely from beginning to end, with excellent support from the others. Charlie Parker’s “Dewey Square” is next, and with this tune the pace once again quickens nicely and continues to accelerate. After sharing the lead during the head, the brothers trade off as the song goes along, almost as if each is daring the other to “Top that!” Taylor on piano has a notable solo about four minutes in. The brothers take over for the last two minutes and everyone goes out in style. For the next song, “On A Clear Day”, Dwayne trades his saxophone for a piccolo (?). This song was written by Alan Jay Lerner and Burton Lane for the 1965 Broadway play “On A Clear Day You Can See Forever“, which was made into an utterly forgettable film starring Barbra Streisand a few years later. Safe to say, the Twins do a much better job with the material than Streisand did. “On A Clear Day” is one of those light, bright, happy songs that make it almost impossible for you to feel unhappy while you’re listening to it. Indeed, Dwayne can be heard delightfully giving in to his pleasure during the last two minutes of the song. At this point I am going to skip ahead to the final song, Gigi Gryce’s “Minority”. While Gryce never achieved the popularity of Parker or Coltrane, he was an outstanding sax player and a prolific composer. “Minority” is a fine example of both Gryce’s work and bebop in general, and the present company does a superb job with the material. Guitarist Moore has a nice solo you won’t want to miss about two and a half minutes in. All in all, I have to say that “The Bosman Twins Play Standards” would make an excellent addition to your personal playlist, for a Saturday or any other night. 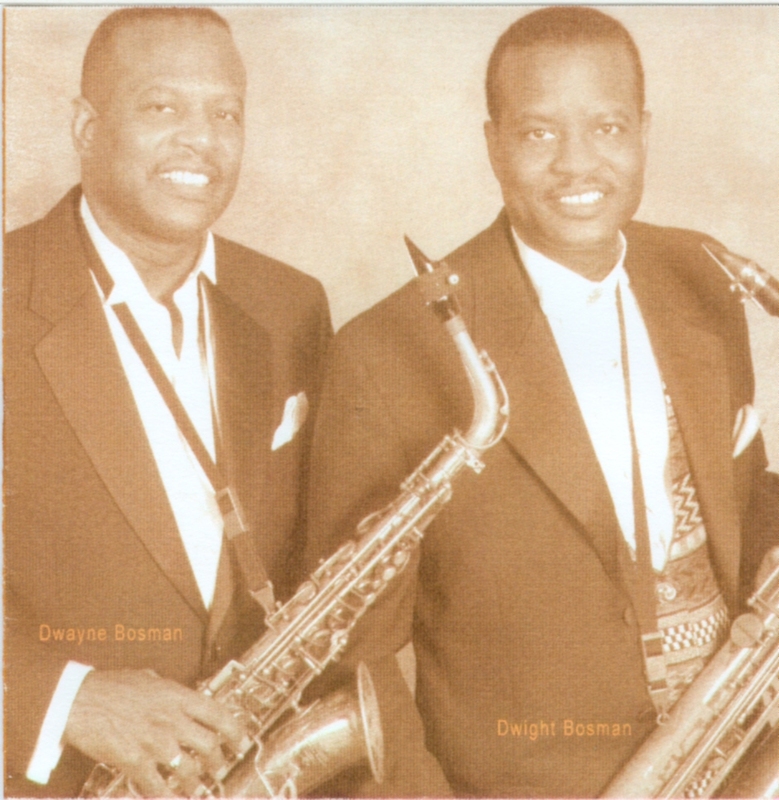 To learn more about Dwight and Dwayne Bosman and their music, visit their web site. The St. Louis Beacon published an informative article about the brothers in 2013, and you can read it here.